Strictlymarket-o: new Byron retail precinct enters consultancy stable! The multi-million dollar Mercato on Byron retail precinct is the latest in a string of exciting new retail developments in southern Queensland and northern New South Wales to be promoted by Brisbane-based consultancy Strictlymarketing. Construction of the dining and entertainment precinct is on track for its scheduled open date in April, and developers Azzura Investments Limited and Wingate Property have appointed the specialist retail marketing agency to manage its brand development, launch campaign and ongoing marketing. Bev Strickland, Managing Director of Strictlymarketing, said the landmark project will deliver a modern convenience and entertainment based, community inspired retail destination for locals and tourists. “We are very excited to be working on such an exciting new project. The developers are visionary and passionate about creating something that is progressive, yet in step with the Byron Bay community,” Ms Strickland said. Mercato on Byron is not only Australia’s first regional retail precinct aimed at achieving a 5 Star Green Star Retail Centre Design v1 2018 rating, but is also Byron’s Bay most ambitious development in decades. 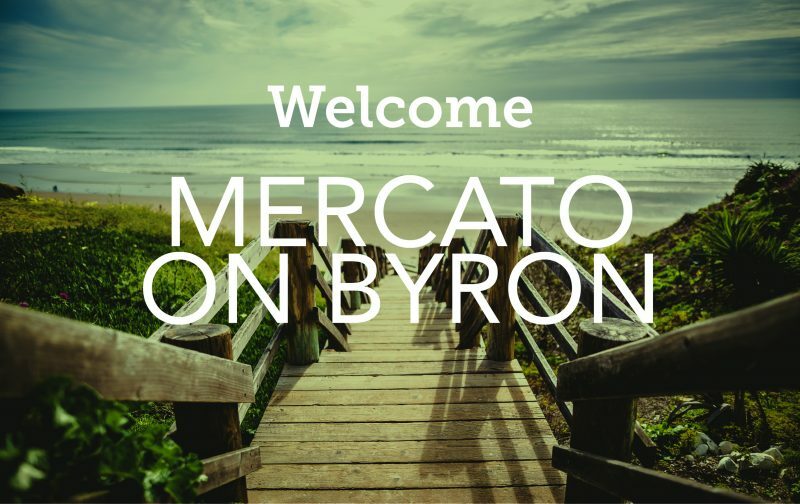 “Mercato on Byron is set to become a true community hub and lifestyle precinct in what is arguably one of Australia’s most popular tourist destinations, Byron Bay. “The Byron Bay community is known for its environmentally conscious approach and focus on local produce. This new development will offer everyday convenience while maintaining the buy local philosophy and the 5 Star Green Star rating means that emissions, water use and impact on the land at the site are kept to a minimum both during construction and operation,” Ms Strickland said. Mercato on Byron will feature 7,895sq m of retail space across two levels anchored by Woolworths Supermarket, Palace Cinema, the iconic Beef&Beach restaurant and an additional 30 specialty retailers. Local shoppers and tourists will share more than 337 carpark spaces and 24 motorcycle bays. The centre will also feature a food and beverage outdoor dining precinct offering an eclectic mix of cuisine, trading seven days a week. Mercato on Byron is being marketed for lease by Sophie Christou of Raine and Horne and Kelly Buxton of Colliers International and is the latest in a number of high-profile retail appointments secured by Strictlymarketing. The specialist retail marketing agency was recently appointed to the open-air precinct Soul Boardwalk at the base of the luxurious Soul tower in Surfers Paradise and reappointed to market The Barracks on Petrie Terrace, Brisbane. More than your average marketing agency, Strictlymarketing offers the full spectrum of modern marketing capabilities including Business & Marketing Plans, Marketing & Market Research, Creative Design, Digital Marketing and Media Relations.